Cleveland Lakefront Nature Preserve Restoration Sign. Photo courtesy of Laura Gooch. Since mid July 2014, volunteers from Kirtland Bird Club and Western Cuyahoga Audubon have been conducting systematic surveys of birds at the Cleveland Lakefront Nature Preserve (CLNP). The surveys, which consist of five minute counts at 17 designated locations at the nature preserve, are expected to continue at least weekly for 3 to 5 years. Surveys are being performed in coordination with Black Swamp Bird Observatory. In a little over a year of surveying, volunteers have performed 105 surveys and documented 169 species of birds at the site. Observations in June and July of 2015 uncovered a large number of species breeding at CLNP, including Wild Turkey, Yellow-billed Cuckoo, Black-billed Cuckoo, Willow Flycatcher, Great Crested Flycatcher, Eastern Kingbird, Warbling Vireo, Red-eyed Vireo, House Wren, Blue-gray Gnatcatcher, Brown Thrasher, Northern Mockingbird, Gray Catbird, Wood Thrush, Common Yellowthroat, American Redstart, Yellow Warbler, Song Sparrow, Eastern Towhee, Indigo Bunting, Red-winged Blackbird, Orchard Oriole, Baltimore Oriole, and American Goldfinch. In addition to being provided to Black Swamp Bird Observatory, all data collected by the volunteer surveyors have been uploaded to Cornell’s eBird database. Cleveland Lakefront Nature Preserve (CLNP – also known as Dike 14) is an 88-acre man-made peninsula that juts into Lake Erie on the east side of Cleveland, Ohio US. Because of the extensive development of the surrounding Lake Erie shore, the undeveloped land at CLNP is a critical resource for migratory birds in the Cleveland area. North-bound spring migrants need lakeshore habitat where they can stop and refuel before they attempt to cross the barrier of the lake. Fall migrants, exhausted by the lake crossing, need shore habitat where they can recover. At 88 acres, CLNP is the largest area of undeveloped lakeshore habitat between Huron and Painesville, Ohio, a shoreline distance of over 70 miles. Birds (and birders) love CLNP! Habitats in the nature preserve include open meadow, brushy areas, and early successional forest, and the preserve provides good views of water birds on the surrounding lake. Systematic bird surveys that began in July 2014 had documented 182 species at the site by the end of 2015. Observations beginning as long ago as the 1960s have noted over 280 species. In addition to birds, the area hosts over 42 species of butterfly and 16 species of mammals including white-tailed deer, mink, skunk, red fox, and coyote. The National Audubon Society designated Dike 14 as an Important Bird Area in 2000 in recognition of the area’s importance to the preservation of migratory and resident birds. Above: Click/tap this button to visit the Cleveland Lakefront Nature Preserve page, a Western Cuyahoga Audubon Birding Hotspot. In 2014, Western Cuyahoga Audubon Society, Kirtland Bird Club, and the Audubon Society of Greater Cleveland adopted CLNP as a site for on-going monitoring of bird activity and initiated the Avian Survey Project. This entirely volunteer project received initial funding through a grant from the Grange Insurance Audubon Center’s IBA Small Grants Program. The goal of the project is to perform surveys at least weekly for 3 to 5 years. CLNP surveys use two basic methods to document bird activity at the nature preserve: point counts and daily checklists. On each survey day, one or more volunteers perform timed counts at each of 17 fixed points at the site. During these 5 minute counts, observers stand at the designated point and record all birds seen or heard. Each day, they also complete a checklist, documenting all species that are seen or heard, whether during a point count or elsewhere at the site. The Avian Survey Project was developed in coordination with Black Swamp Bird Observatory (BSBO). The standardized protocols used to collect the data ensure that they can be compared to data collected at other research stations in the region (including BSBO’s main station on the Lake Erie shore in Ottawa National Wildlife Refuge) and will provide valid long-term monitoring. Between the survey’s beginning in July 2014 and the end of 2015, 21 volunteers performed 166 surveys at the site, averaging slightly more than 2 surveys per week. At least one survey was performed in almost all weeks, although deep snow during the winter of 2014-15 caused several weeks to be missed. ​As is mentioned above, the surveys had documented 182 species at the site as of the end of 2015. In addition to the migrating warblers, sparrows, thrushes, and others that pass through the site in spring and fall, a wide variety of species nests at CLNP. The following is a partial list of species that were confirmed or probable breeders at CLNP (as of the end of 2015): Wild Turkey, Yellow-billed Cuckoo, Black-billed Cuckoo, Ruby-throated Hummingbird, Red-bellied Woodpecker, Downy Woodpecker, Northern Flicker, Willow Flycatcher, Eastern Phoebe, Great Crested Flycatcher, Eastern Kingbird, Warbling Vireo, Red-eyed Vireo, House Wren, Blue-gray Gnatcatcher, Gray Catbird, Brown Thrasher, Northern Mockingbird, Cedar Waxwing, American Robin, Wood Thrush, Common Yellowthroat, American Redstart, Yellow Warbler, Eastern Towhee, Song Sparrow, Indigo Bunting, Northern Cardinal, Red-winged Blackbird, Orchard Oriole, and Baltimore Oriole, American Goldfinch. Click/tap image corner to enlarge and for details. Click/tap social sharing icons to share with your Friends on social media. 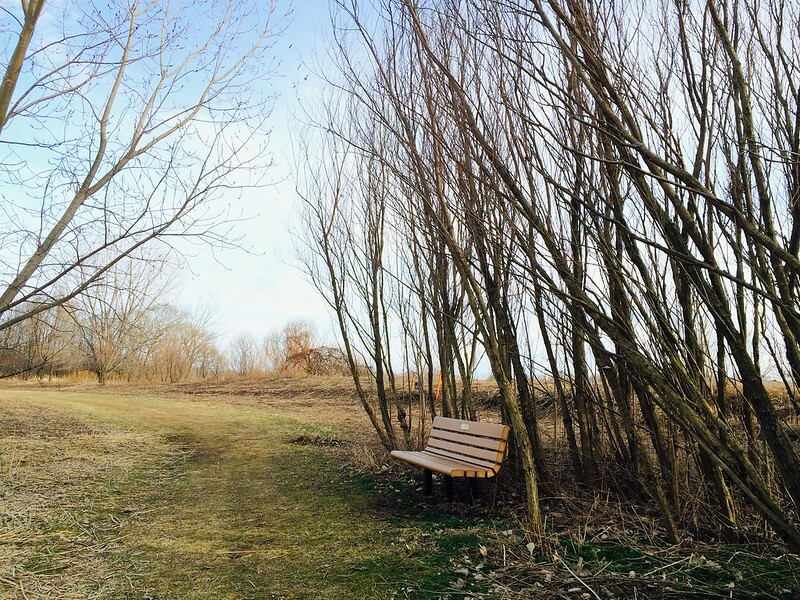 In the long view, and as part of the natural landscape of Cleveland, the history of Cleveland Lakefront Nature Preserve goes back much farther than you would expect. In fact, one logical starting time is in 1896. In the late 19th century, Cleveland city planners and philanthropists saw a need to preserve park land to provide a refuge from city life. The most ambitious park system on the east side of Cleveland lay along the Doan Brook, extending upstream from the brook’s mouth at Lake Erie, through University Circle, and to the Shaker Lakes. The land at the mouth of the brook was owned by William J. Gordon, who began to develop a park on 122 acres there in 1880. He donated that park to the City of Cleveland in 1893, stipulating that it remain a park. Lying along Lake Erie at the mouth of Doan Brook, Gordon Park became a popular boating and bathing spot. Land donated by Martha Ambler, Patrick Calhoun, John D. Rockefeller, Laura Rockefeller, and Jeptha Wade completed the Doan Brook park corridor all the way to the Shaker Lakes by the early 1900s. In 1962, two derelict freighters were sunk in Lake Erie just west of the mouth of Doan Brook, ostensibly to form a breakwall to protect the beaches at Gordon Park. Over the ensuing 10 to 15 years, solid waste was dumped along the lake shoreline between the shore and the two freighters, eventually forming a 10-acre land area between the freighters and the shoreline. In 1972, the Federal Water Pollution Control Act Amendments required a change in the method of disposal of contaminated sediments (consisting of sand, clay, and other soil material) that were dredged from navigation channels in Lake Erie and the Cuyahoga River. Prior to this legislation, the sediments, some highly contaminated with industrial pollutants, were simply dumped back into Lake Erie farther offshore. The 1972 law required that contaminated material be placed in Confined Disposal Facilities (CDFs), which were intended to prevent contaminants in the sediments from reentering the waterways. The U.S. Army Corps of Engineers located a CDF in Gordon Park at the mouth of Doan Brook. The brook was diverted into a half-mile-long culvert (underground pipe) that would lie under the dredged fill material, and a wall made of steel sheetpile and stone riprap was built around an 88-acre area that encompassed the two sunken freighters and the adjacent garbage dump. The Corps of Engineers placed dredge spoil in the CDF at CLNP, designated as Dike 14, between 1979 and 1999. After disposal ceased in 1999, the area was fenced and essentially unused for over ten years. Citizen activism discouraged proposals to further expand the area for disposal of dredge material and encouraged the Corps of Engineers and Cleveland-Cuyahoga County Port Authority to make good on a prior commitment that the area would revert to park land after fill reached the 1999 levels. The Port Authority took control of the site in 2001. In 2006, the Cuyahoga Soil and Water Conservation District conducted a study of soil contamination at the site that established that the area was safe for passive recreation. One section in the southwest part of the site showed somewhat higher levels of contamination. This area was subsequently capped with clean fill material. In 2012, the Port Authority changed the name of the area from Dike 14 to Cleveland Lakefront Nature Preserve and formally opened the area to the public between dawn and dusk. Since then, the area has been used for passive recreation, including hiking, photography, and birding. In addition, field trips to the area have become a regular part of science education for children from schools in Cleveland and surrounding cities. Because the vegetation at CLNP originated from seeds in material dredged from the Cuyahoga River and Lake Erie, and because the area was highly disturbed, many of the plants at the site consist of non-native invasive species. In 2015, the Port Authority commissioned a study of the area’s vegetation and the development of a plan to control invasive plants and establish native vegetation. The first part of this effort, which will be phased over a number of years, included elimination of invasive plants over the southwest part of the site in the fall of 2015. The areas treated in 2015 will be reseeded with native vegetation over the next several years, and additional areas will be treated. Gooch, Laura C. 2001. “The Doan Brook Handbook.” Available on line at www.doanbrookpartnership.org. Interested in volunteering? We need surveyors! Intermediate or advanced birders are invited to join the survey team. Less experienced birders are invited to join existing teams to gain experience. Send an email to info@wcaudubon.org titled, Attn. Laura Gooch.